Kodi is a Home Media Server (basically your own personal Netflix) formerly known as XBMC. 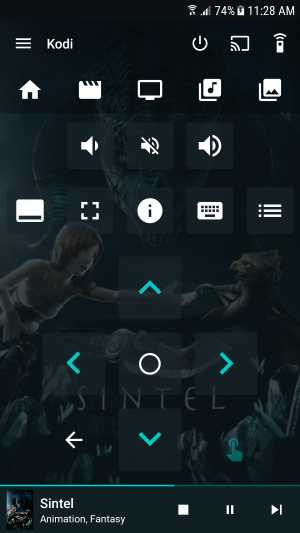 Kodi is currently an optional build that can be installed from the optional menu of the setup script. See here for more information on setting up Kodi. Visit the RetroPie-Setup Screen, select Optional Packages, and select Kodi. Installation can take 10 minutes. After installation, you will be able to go to the Ports section and view Kodi as an option. RetroPie currently installs Kodi 17.6 "Krypton" on Raspbian Jessie and Kodi 18 "Leia" on Raspbian Stretch and Ubuntu PC systems. You can see what your joystick name is with cat /proc/bus/input/devices. The first method here is a cleaner method that won't mess with the RetroPie setup script updates. (Note: in the future, you will have to manually update /home/pi/.emulationstation/es_systems.cfg, as it will not be overwritten by RetroPie updates.) Once you've installed Kodi from the optional menu of the setup script, drop into a terminal with F4 or access the pi over SSH. Save your changes with ctrl+x , y , enter. Type emulationstation to go back into EmulationStation, and Kodi should be there as its own system. Then follow the directions to configure your VPN provider. If it's unsupported (like NordVPN) you can set it to user defined, manually import the server configurations, and set them up as their own source in the Kodi file manager so they are accessible to the addon.